One of the questions I am most often asked is how long horses need to stay here for rehab, and what happens when they go home. The answer, as with most questions about horses and hooves, is "it depends"...but I always recommend to owners who are interested in sending a horse to us that they must commit to the horse being here for 3-4 months. My aim with every rehab horse is the same - to send it back home when its hooves are capable of a consistent level of exercise and able to work on a variety of surfaces, including 10-15 miles of roadwork per week. Usually this takes 3-4 months - some horses take less time, some take more - but no two horses respond in quite the same way. 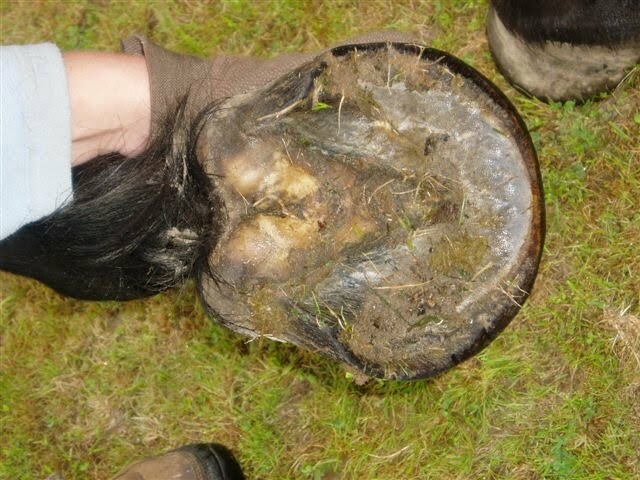 When horses go home, its essential that they are kept in consistent work because after 3-4 months they will have grown at least half a new hoof capsule, but not a full one, so the following few months must be treated as a continuation of their rehabilitation. Its definitely the case though that once horses have grown half a good, well-connected hoof capsule and have established correct patterns of movement and landing, its relatively easy to carry on the good work. Horses go home with a final report, for the owner and their vet, and detailed nutrition and exercise guidelines. Owners often have to make some changes to their management routine, but although they mostly find it nerve-wracking (at first) to take full responsibility for their horses' hooves at home, there is always help and support available and the satisfaction of seeing their horse's hooves improve seems to make up for all the hard work. Project Dexter - eventing update! 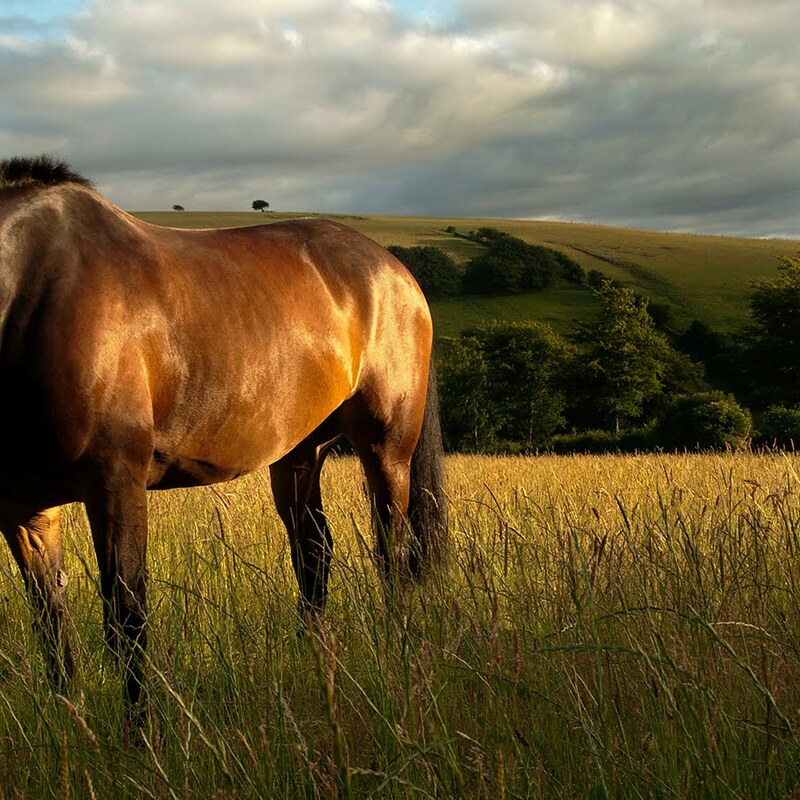 Project Dexter is of course named after this horse, a now 11 year old TB called Dexter. He was the first horse whom we included in the project, and this is him competing recently :-) He and Kelly are doing another one day event in a week or so! One of the interesting things about the Project Dexter results is the range of therapies that have been tried out on the horses before they come to us. There are examples of most sorts of remedial farriery (wedges, imprints, bar shoes, pads, Natural Balance) and a whole panoply of drug therapies and supplements. Now its true that very often just taking the shoes off a navicular horse will help its foot balance and allow for better engagement and stimulus for the caudal hoof, but its also true that simply taking the shoes off some horses like this will very often leave you with a sore horse who is unwilling to even walk around or has got himself into habitually bad patterns of movement. These are the sorts of horses where people say "I tried barefoot and it didn't work for my horse." Turning an unhealthy hoof into a healthy hoof requires more than just taking the shoes off - it requires a holistic approach involving diet, environment and last but not least a sympathetic trim. Here is the short clip of Bailey, the newest arrival, filmed the day he arrived and then in the later clips exactly 2 weeks later. He already had a good, robust digital cushion when he arrived but was landing toe first and short-striding. Apart from to film him, we don't ask him to go over hard surfaces much as he finds them a struggle, but its exciting to see him so ready to improve his footfall. Just a quick update on technology, as well, to say that it all appears to be working finally so feel free to use the rockleyfarm email address again! Normally the horses who come here for rehab are in shoes, and have been for some time. Its been very interesting by comparison to monitor Storm's progress, as he had been out of shoes for many months before he came to us. Of course all the rehab horses (including Storm) are here because of specific injuries or pathology, and rehabilitating that is our primary aim. The problem is that we don't just have to do that, we have to do that as well as taking the horses out of shoes, and that adds in a whole new area of rehabilitation. I'm aware that the effect that shoes have on horses feet is a deeply controversial area, and to be honest its not a discussion I want to get involved in here, not least because I don't think we really know, at the moment, the full details of the physiological effect shoes have on horses' feet. We can see that there is a tendency for heels to contract in shoes, but not always; I have a suspicion that stress shielding may be a problem for some horses or that nerve damage may sometimes happen, but there is a dearth of systematic research out there. Its an interesting comparison, though - Storm had a severe DDFT injury and a pronounced toe-first landing when he arrived BUT his hooves were not reliant on shoes and he was comfortable, although not landing correctly, on tough surfaces from day one. By contrast, most horses very much rely on the pea gravel and other conformable surfaces to keep them comfortable for the first couple of weeks out of shoes. This doesn't stop them from making rapid progress and improving their landing equally quickly, but you feel that they are having to tackle 2 types of rehabilitation - their original injury plus re-adjusting to being out of shoes - rather than just one. Thought I had done that on Sunday and that all would be well only to find that the new company had servers down and were unable to host the site - as well as losing all my RockleyFarm email into the bargain....Of course they'd also charged me for hosting the site in the meantime, even though they didn't actually provide any service at all... so I am now having a fight with them about that. Its very early days for Bailey, whose shoes had been off less than 2 weeks in the lower photo, but its an interesting comparison nonetheless. In Bailey's case, his heels are non-existent at the moment, as well as being under-run, but already he is using the caudal hoof more effectively, and landing better, than he was in shoes and this is reflected in the photos. He finds hard uneven surfaces a challenge of course, but being on the tracks has enabled him to start improving his feet. Project Dexter is our research project into rehabilitation of horses with "navicular", caudal hoof pain, DDFT/collateral liagment injuries. Every horse who comes to Rockley with these diagnoses is included in the project, which runs entirely due to the help, goodwill and support of Prof. Peter Clegg at Liverpool and numerous horse-owners and their vets, to whom I am eternally grateful! Horses are assessed by their own vets, and 10 different (and sceptical!) vets have been involved so far. The preliminary results for Project Dexter are shown below. The research project started in February 2008, with Dexter and horses are listed chronologically. As at June 2010, 13 horses are included - 10 have completed their rehab, 3 are ongoing. 8 out of 10 horses are in full work, including jumping and hunting; 1 horse returned to light work; 1 horse (which had severe bone damage) improved but did not return to full work. 7 out of 10 horses have been re-assessed by their referring vet, confirming the improvement or return to soundness. I have had to shrink the table to fit it onto the blog - if anyone is interested in the full details, please email me: nic@rockleyfarm.co.uk and I will send you a copy. A different sort of storm! This was the scene as I came back towards Exmoor on Tuesday afternoon - a pretty dramatic sky by English standards! I just happened to have the camera with me and the wheatfield looked so bright by contrast that I had to grab a photo. Felix is one of those horses who is so good that (although he could never be taken for granted) you can, very occasionally, overlook him, simply because he does everything with no fuss, absolutely competently and perfectly calmly. He worked hard hunting last season, clocking up the highest mileage of all our horses, and was ridden by at least 5 different people, all of whom had a fabulous day with him. Equally, when Lady's owners came up to ride, he was a perfect gentleman for a small 10 yr old rider, going in front or behind at whatever pace she asked, and doing his utmost to enable her to open and close tricky gates. As I've said time and again over the last 6 years, thank goodness for Felix. I am hoping in the autumn to run a couple of one-day clinics which will be open to everyone, not just UKNHCP students. Mark Johnson, who teaches the UKNHCP dissection and anatomy modules has agreed to do a special one-off day here, in September, and Lavinia Mitchell has also agree to do a day on saddlery in October. The full details are on the new Events page above: http://rockleyfarm.blogspot.com/p/events.html so if you are interested, please get in touch! For me, one of the key aspects in rehabilitating horses with "navicular"/caudal hoof pain/DDFT or soft tissue injuries is movement. That may sound perverse, but its absolutely vital. All of the horses who come here have a compromised caudal hoof, though the specific injuries vary enormously. Most have also had lots of treatment to try and shore up the weakness, which (for the reasons I talked about last week http://rockleyfarm.blogspot.com/2010/07/horses-hooves-need-support.html and earlier http://rockleyfarm.blogspot.com/2010/06/bar-shoes-and-such.html) tend to address the symptoms, not the cause. The fact is that these structures only become stronger when they are stimulated by work and unfortunately there is nothing so effective as a horseshoe for taking these structures out of work. Its also the case that usually horses will try to keep moving at all costs - if they can't move correctly because of caudal hoof pain, they will move incorrectly, landing toe-first and putting yet more stress on the DDFT and, eventually, the navicular bone. If you want to deal with the cause, the critical thing is to start to strengthen the caudal hoof - which means the fibrocartilage within the digital cushion, the frog and all the myriad tendons and ligaments which surround and support the navicular and pedal bones. This will only happen with work, but its counter-productive for the horse to work incorrectly, of course. Realising this, many vets advise that horses with this type of injury are put on box-rest, but that only solves half the problem - it puts a stop to the incorrect movement, but doesn't build the caudal hoof. Instead, the answer seems to be to allow and encourage movement, but only within the zone in which the horse can move correctly. Initially, this may be extremely limited - perhaps only free movement on a deep pea gravel track. What we find time and again, though, is that by sticking to this principle we are able to rest the injury while helping the horse to build up the caudal hoof, and that over time correct movement can be re-established. Another Storm update, following his owner's visit this week. He has made tremendous progress, particularly since on MRI the damage to his DDFT was severe. Here's a brief comparison of his landing from arrival till now. ...is confusingly called Bailey ;-) He is the latest, terribly handsome, rehab horse (I have a very long-standing soft spot for dun horses!) and is landing classically toe first at the moment. He has been shod in Natural Balance shoes up til now. There will of course be lots more about him as he progresses but for now here are a couple of photos and his "day one" footage, above or in high definition at: http://www.vimeo.com/13159538. There are lots of phrases and ideas which are bandied about in connection with hooves, and in the past I, like many people, have often accepted them at face value without really thinking through whether they actually make sense or not. The use of bar shoes and wedges, which I talked about last week, is one example. Seems a good idea superficially, but when you think about it more carefully, there are problems. The idea that horses' hooves need "support" is another classic. I vividly remember a friend of mine, who is an equine bodyworker, telling me that she would never take her horses' shoes off "because I believe their hooves need support". Support is an emotive word - it implies protection, care and cossetting, and suggests that by providing it we are doing the horse an enormous favour - perhaps even preventing him from harm. Surely only a monster would seek to deprive the horse of "support"? "Support" is a word which is also frequently used in conjunction with remedial shoeing - low, under-run heels need "support" from a shoe. Again, it sounds like the best thing for a weak hoof. Unfortunately, this type of external "support" has one huge drawback - it reduces stimulus to the frog and also tends to mean that the hoof loads heavily on the hoof wall; over time the internal support structures - particularly the digital cushion - weaken. Its a terrible dilemma for the horse owner, especially if the horse is lame and it nerve-blocks to the caudal hoof. I recently saw a comment from an owner about exactly this type of horse; she had even considered taking it barefoot but had decided that her horse had such weak hooves that this would be disastrous - he needed the "support" of shoes because, without them, his heels would be "on the ground". The irony is that without stimulus from "the ground", his heels are likely never to improve. Here is an interesting set of photos - interesting if you are a hoof anorak, that is.... The top photo is of Storm's LF a while before he came here. You can see the heel buttress and that there is a lot of heel above the frog - if you laid a rasp across the back of the foot there would be a considerable gap between heel and frog. The hoof is otherwise healthy-looking; it might look as if the heels are too high, though but in fact its the frog which is under-developed. You can imagine that this type of foot would have a tendency to land toe first because of the weak caudal hoof. By comparison the 2 lower photos show Storm as he is at the moment. The frog has changed texture and is much more substantial - its a virtuous circle - the frog and caudal hoof are stronger so he is much more able to land heel first, making the frog and caudal hoof stronger so he is much more able to land heel first, making the frog and caudal hoof stronger...You get the general idea...! However, Charlie and I pay no attention to this gross aspersion - we prefer the opinion of our Master, who says that Charlie looks "MAGNIFICENT"! Its a good thing Charlie has never asked "Does my bum look big in this?" because the answer would invariably be yes, but how else is he supposed to gallop up the hills for the next 9 months....??? "Sometimes I think a lot of farriers don't realise how much damage shoes do..."
I've been thinking recently about the myriad "training methods" for horses which are out there at the moment, each with their own guru (as often as not) and each presenting itself as THE way to train. When you look more closely, there are numerous similarities and overlapping themes which link them (even if they try to deny it!) but the individual trainers are understandably more interested in emphasising why they are different - which in such a crowded marketplace is only to be expected. From the horse's point of view, though, its much simpler - there are only 2 ways to train a horse to do something (lets call it Plan A). You either (the "Carrot") make Plan A intrinsically attractive so that the horse is happy to do it or (the "Stick") you make Plan B so unattractive that Plan A becomes the lesser of 2 evils. In the real world, of course, there can be occasions when both techniques are used at once, and often neither is right or wrong. For instance, you can get a horse in from the field and away from his friends by putting a headcollar on and leading him, or (if he loves his breakfast!) you can simply let him know that breakfast is served and watch him gallop in of his own accord. Still, I find the "Carrot" and "Stick" a useful way to demystify training techniques and look at horse's behaviour. Here, for example, we often have rehab horses who have "behavioural" issues - sharp, lazy, bad to load or travel or whatever. I am not a "trainer" - my job is not primarily to solve these behaviours but to improve hoof health, and therefore soundness, and get each horse moving as well as possible. What is fascinating, though, is the number of times that "behavioural" problems simply go away once horses are sounder and have better feet. Its not because we used a "Stick" to make the horse behave differently, but because of the "Carrot": the horse now finds easy and comfortable something which was previously painful or difficult - end of training problem. An exciting follow up to yesterday's blog update on Frankie...He is now back home and his owner kindly arranged for him to go back to his original vet, Jason Tupper at the Royal Veterinary College, for re-assessment. Frankie has quite a complicated history, being intermittently lame on both left and right front legs over an 18 month period. He would come sound for a short time but the lameness would recur when he came back into work. The left front was (and remains) his weaker foot, and his original veterinary assessment was that he was up to 5/10 lame, at his worst, on the left and up to 2/10 lame on the right. His vet was not only pleased with his improvement but is really interested to see how Frankie gets on over the next 6-12 months.